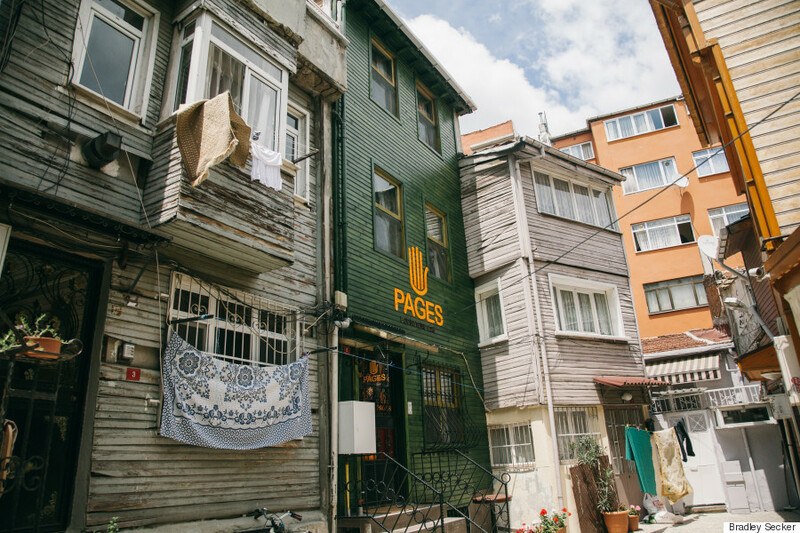 Pages bookshop and cafe, in a fully restored traditional building in Fatih neighbourhood, Istanbul, Turkey. ISTANBUL — Syrian book publishers Samer al Kadri and Gulnar Hajo believe in the power of a good book. But in Turkey, a book written in Arabic is hard to come by, despite the estimated 2 million Syrian refugees now taking shelter in the country. That’s why the couple, both refugees from Damascus, opened their own Arabic-language bookstore in Istanbul on Friday — the first of its kind, to their knowledge. “The Arabs, particularly the Syrians, they need and want a place that is for them,” al Kadri said, sitting in a canary yellow chair at Pages, his cozy new bookstore. “Culture can only start from reading.” Like thousands of other Syrians, it’s been a long and trying journey from Damascus to Istanbul for the couple and their children.Three years ago, intelligence forces belonging to the Syrian regime came looking for al Kadri at his publishing house, Bright Fingers, in Damascus. Al Kadri recalled that he had been outspoken against government repression, which he says is what got him into trouble. “If we don’t speak, who will speak?” he said. Luckily, al Kadri was in Abu Dhabi for work at the time, or he likely would have met the same fate as countless Syrians who have disappeared forever after being detained by the regime. His family didn’t waste any time — they knew that was their cue to leave Syria. They packed their bags and headed to Jordan, then, a year later, on to Istanbul. As the family fled to safety, Al Kadri’s dream of opening a bookstore went with them. On Friday, as Pages officially opened its doors to the public, the dream was realized. Samer al Kadri, the owner of Pages bookshop, a rare establishment where customers can find a range of Arabic, Turkish, French and English language books. Rawad Saman, left, an employee at Pages bookshop, prepares the stock and displays a day before the official opening. Books on display on the first floor of Pages bookshop and cafe in Fatih, Istanbul, Turkey.